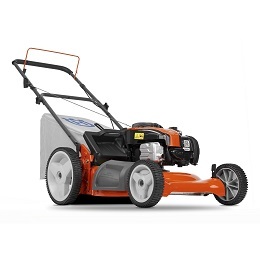 With durable 12-inch rear wheels, this Husqvarna gas-powered push mower, available for $249.95, is easy to maneuver over all kinds of terrain. It’s durable and that’s the main trait we are looking for. The engine runs smooth and the extra wheel height makes a big difference on rougher terrain. Fairly lightweight at 60 pounds, it conveniently folds up for easy storage in the garage. The 3-in-1 cutting system mulches your grass and either collects it in the rear bag or discharges it to the side. The adjustable height lets you handle short or long grass. The cutting path is today’s standard 21-inches.